I suspect the word “cricketainment” and Twenty 20 leagues share a time and place of birth. Truth be told, there is no better way to describe this rapidly rising format of cricket, which was specifically designed to evolve the gentleman’s game into a massive entertainment platform. From sleepy county clubs to genre dominating franchise leagues, the T20 journey is powered by a simple mantra; the bigger the show, the bigger the audience. Although the Pakistan Super League was a little late to the party, it put on a spectacular show that left fans salivating and critics stunned. The catalyst to its success, much like its global counterparts, is the colossal amount of money that was injected into the platform. And when there is that much money involved, there is no better way to spend it than under the garb of ‘marketing’. After all, a bare minimum of 93 million dollars were at stake. Banks have known how to piggyback on Pakistani cricket to showcase their marketing might ever since the good old days of the ABN Amro Cup. However, giants HBL have been perhaps the most consistent supporters and backers of Pakistani players, with cricket-related campaigns commanding a major chunk of their marketing strategy for many years. And thus their urge to be closely associated with the first PSL is understandable. The title sponsors managed to truly milk the inaugural tourney for all its worth. As corny as Ramiz Raja sounds every time he mentions HBLPSL instead of simply saying PSL, the title sponsors have truly milked the inaugural tourney for all its worth. Leveraging ambassadors Afridi, Shahzad, and Gul, the bank hit the ground running with a TVC-led promotional campaign that promised a chance for Pakistanis to win a seat at the final in Dubai. This was followed by a strong digital campaign that made #HBLPSL arguably one of Pakistan’s most successful branded hashtags, creating trends on multiple digital platforms, including Twitter, Facebook, and Instagram. A smart content drive planned around Ramiz Raja gave a day-by-day account from the crease and became an increasingly successful engagement property for the overall digital community of cricket lovers in Pakistan – which is in itself no small feat. Not to be left behind in the song and dance rituals of Pakistani marketing, HBL commissioned an anthem with none other than Ali Zafar, which fared well across mediums, despite the video being a formulaic series of shots taken around HBL landmarks and branches. Nevertheless, HBL’s marketing machinery delivered with quality executions across all media, accentuated with a few interesting one-offs such as the HBL gatling gun that hurled merchandise across the stadium. I may be a cricket simpleton, but I can’t see the value in calling these five contenders ‘teams’ rather than ‘brands’, except perhaps as a nod to rituals and traditions. As I understand it, the players will change each season, there is no demographic or geographic filter and the city names used have no connection or association to the owners. By that logic in the next season, everything changes except the guy who foots the bill and the logo will remain the same. In my book that is a brand. And from within these brands came the most promising use of the Pakistani marketing apparatus since a long time. Full disclaimer here: Being the agency on record for one of the teams, the Quetta Gladiators, I did get a first-hand account of how chaotic the process was with PCB and PSL once the project started and how, very quickly, the red tape was all but streamlined to make way for each team’s promotional efforts to shine through. The richest kids on the block, at least on paper, were the Karachi Kings. Media giants ARY put their muscle behind the Kings, and quickly amassed exposure on the media to ring in a list of celebrity A-listers in support of the team. Ali Azmat was roped in to create an anthem which in my opinion was one of the catchiest in the series and one which quickly found its way into a little crevice of our brains and simply refused to come out. “Karachi jeetay ga” became a rallying cry for the metropolis and rang loud and clear from colleges to chai dhabas across town. The Kings also managed to create the right kind of buzz across social media with their celebrity powered testimonials. Brands associated with the Kings, such as the newly launched Oye Hoye chips, powered on with their own campaigns, spreading the message further with increasing efficiency. 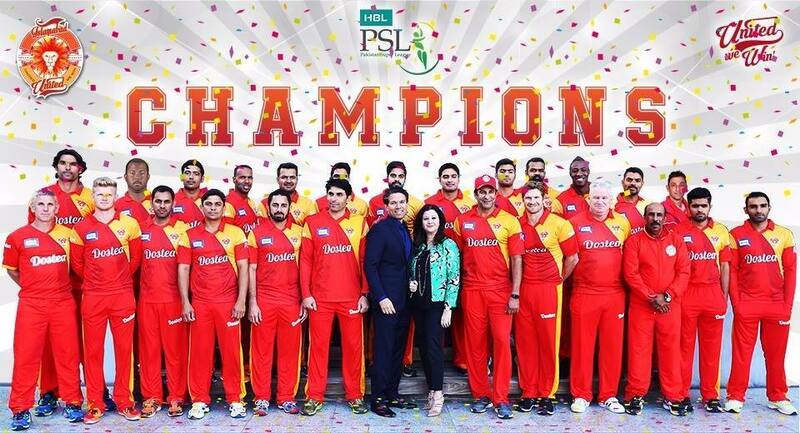 With media giants ARY behind Karachi Kings, this team was the 'richest' kid on the block. Next in line was the Khpal team, anchored around the star power of our very own Lala. Haier boss Javed Afridi’s marketing acumen was on full frontal display as the Zalmis were perhaps the fastest to market their team through traditional media and social amplification. Hamza Ali Abbasi, who is effectively a meme in his own right, was right up there, predictably giving his two cents on every occasion and so became a powerful mouthpiece for the Peshawar-based team. Between Afridi’s bravado and Hamza’s quips, the Peshawar Zalmi hit all the right notes and were one of the most visible faces of the series. Another masterstroke by the marketing minds behind Zalmi was their support for the APS victims, cemented with a launch where the APS students unveiled the iconic logo for the team. This socially relevant conversation was further elaborated with the APS students and their families flying to Dubai for the tournament. Great humanitarian cause certainly - but even better publicity material. Hamza Ali Abbasi, who is effectively a meme in his own right, became a powerful mouthpiece for Peshawar Zalmi. The Lahore Qalandars started picking up steam when they were adopted by Mobilink, which commissioned the rather-apt “Dilon Ke Sikandar” campaign, spearheaded by a TVC that showcased the brand’s vigour and colour. The redshirts also managed a grand launch event, but apart from a few interesting things in between, like the Qalandar Force Heavybike Rally, their marketing seemed to be dominated by Mobilink’s backing as a brand. It helped that Chris Gayle, a publicity machine in himself, managed to gel in with the Qalandar’s jolly positioning, although their association with Geo helped bulk up Lahore’s marketing efforts, I felt that the city’s rich culture could have been better used to showcase a grittier, more authentic brand persona. The Gladiators from Quetta were arguably the most interesting team to watch on the field. Their marketing campaign, however, wasn’t as loud as some of the other teams. The tone and positioning of the brand’s underdog ethos was intentionally set from day one, when in our initial meetings with the owner, Nadeem Omer, the emphasis was on “serious cricket” rather than the bells and whistles typically associated with T20 bonanzas. This was perhaps the only team that did not rely on celebrities to increase brand visibility. 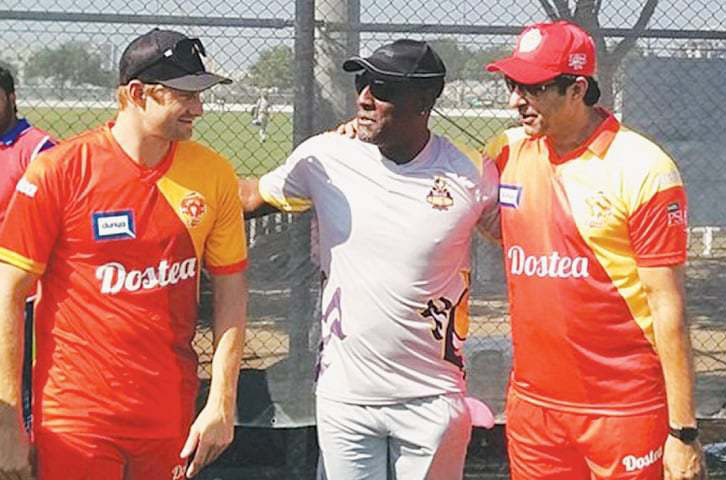 By design, Quetta’s decision to spend the money on persuading Sir Viv Richards, a living legend, to become the team’s mentor was based on practical assumption; morale-building. But Richards managed to eclipse everything else in the tournament, and with his beaming smile and his Quetta Gladiators shirt, took up more airtime than any other single personality in the tournament. Richards, in effect, not only helped bring greater visibility for Quetta, he made headlines with his animated enthusiasm. 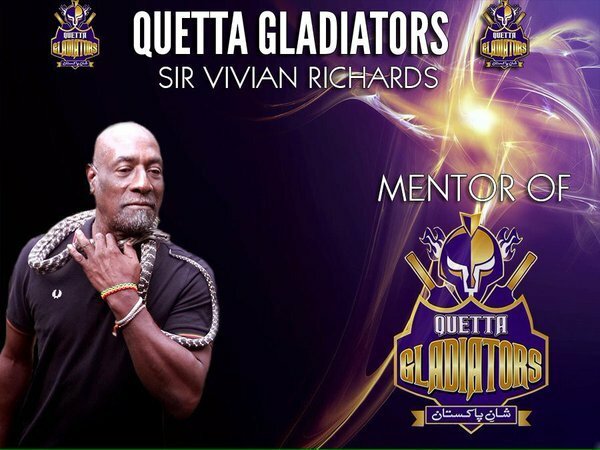 Sir Viv Richards not only helped bring greater visibility for Quetta, he made headlines with his animated enthusiasm. The other big thing Quetta had in its favour was a strategic partnership with PTV Sports, which despite being a little less aggressive compared to other channels, enjoys unparalleled access to audiences across the country. Short of Richards jumping on the field, no team had greater visibility on the greens than Islamabad United with their flashy orange uniforms. Wasim Akram in that orange jumpsuit is sure to be seared into your head for all time. Wasim Akram in that orange jumpsuit is sure to be seared into our heads for a long time. Add to the mix Fawad Khan and Ali Zafar, and Islamabad was quickly established as the team with the right gloss, energy and sophistication. Islamabad United’s marketing plans seemed to be centred on three key pillars; Ali Zafar’s anthem, Akram presence, and a powerful association with new-age influencers on traditional and social media. In terms of digital content marketing, Islamabad had the most mature of all teams, amplifying their fan base with instagrammers and twiteratti with great prominence. Islamabad United got to keep the cup. However as a whole, the one brand that truly won is Pakistan itself. Even in defeat, teams showed a rare mix of sportsmanship and mutual respect on social and TV media, which showed the world that we too can be gentlemen when it comes to playing the game. 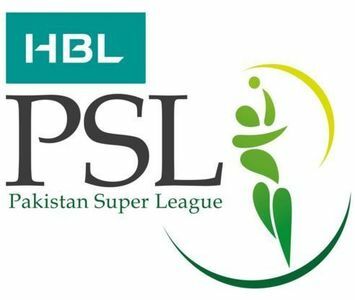 The first PSL is an achievement because it showcased to the world the people power of the Pakistani demographic, the management of the Pakistani board, and the economic potential that big-scale Pakistani entertainment ventures can carry. The brief that was given to this motley crew of brands, agencies, media houses and assorted professionals was not only to execute a T20 tournament. The brand in question is not Gladiators or United, it is Pakistan. The marketing objective is to change Pakistan’s perception. The KPI is to create an economically sustainable model to support this brand perception shift exercise. If we can manage to make a tattoo-sporting Englishman like Kevin Pietersen tweet in Urdu, I think we have won the pitch already. It definitely is Pakistan, the winner! What to watch on TV now? Ok, Asia cup is coming. Congrats to all Pakistanis from India. Ahmed Shehzad only played because he was supported by KP and Sangakarra. Sharjeel threw his wicket in a cruch match.. Brad haddin and Dayne Smith Played steered the match for Islamabad. So where is the Pakistani batting talent?? Do we have to still rely on Afridi, hafeez, shehzad or akmals?? No matter what others think, Indeed PSL is a winner all the way. The PSL is over, its tremendous efforts by the PCB & specially Najam Setti sb, this remarkable success & goals achieved by their members, people of Pakistan & all teams. Particularly, Pakistani people residing abroad & come to UAE for seeing to PSL. It makes differentiate between PSL & IPL, its come to know the Indian’s people wanted see the PSL, Indian player wanted to play PSL. It is an example that how to an event arranged without glamour. The entire Pakistan nationa is to be proud on successfully executed this league, no matter which team has won, its success of Pakistan. So many people had given negative comments before starting of PSL, now what would they tell. Please think positive for Pakistan. Congratulation! PCB & Najam sb. & all nation. Very well organized tournament. PCB deserves applause here. Great job Pakistan. Long live PSL. @Weirdity Really? How did it do that? @ -about an hour ago : this was a school tournament compared to IPL..
@Weirdity : I promise you it was no where near IPL.. my friends in UAE told me that there may not be the second tournament..i hope they are proved wrong! @Weirdity Stop embarrassing rest of Pakistan with these strange claims. IPL is and will remain the biggest cricketing league in world unless China start playing it. PSL can challenge Big Bash in long run if certain things go in right direction starting with law and order. PSL at home grounds with teams playing in their home cities will be the defining moment for PSL in long run and hopefully we can see that in coming years. If Lahore plays Karachi at Qadaffi stadium or Lahore visit Karachi in National stadium for a PSL match, that would generate serious money and craze. Some suggestions: Marketing in the UAE was not up to the mark. No newspaper ads, no big billboards advertisement. So next time there is need of much improvement in this sector. Secondly, most of the matches should be held in Sharjah because the stadium in Sharjah is easily reachable for being in the middle of the city unlike the Dubai stadium that is outside the city. Most of the Pakistanis here are laborers and don't have transport facilities to reach the Dubai stadium. So if PCB arranges neary 30/40 buses to pick the fans from some point from Sharjah and Dubai to stadium, it will definitely help to fill the stadium. 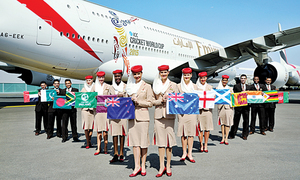 Weekend matches can be staged in Dubai but the matches on working days should be held in Sharjah. Franchises should distribute their shirts free of cost to the laborers so that they take more interest in the matches. Inclusion of some more big name like AB devilers, Maxwell etch. Rewards for audience are also an essential part to make the PSL a success. 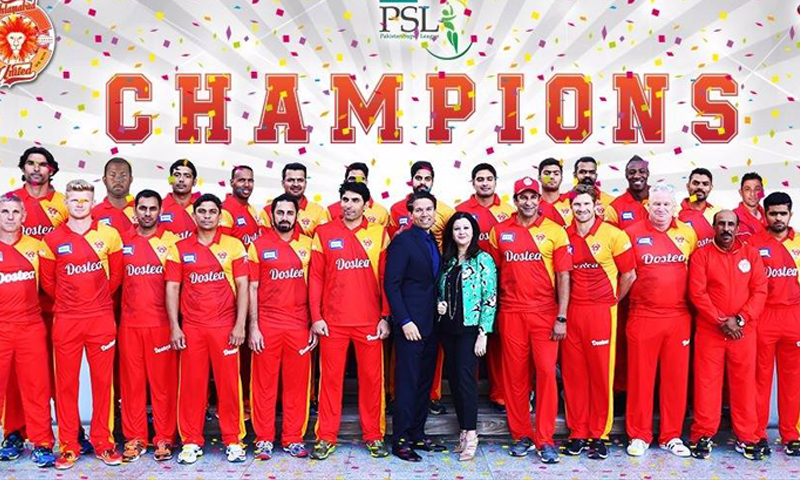 Great Job done - Well done everyone (Y) Looking forward for the next year PSL with even more excitement! Karachi on the other hand was doomed with all their eggs in the M Amir's basket & the dreaded Indian blue colors were a shame to say the least. @Weirdity Are you serious. The brand value of PSL is $98 million and the brand value of IPL is $2.5 Billion. Is there a sight uglier than Umar Gul?? Good job ! When will this be played on Pakistani soil ? 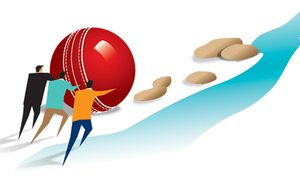 If Shane Watson is in your team, off course you are going to be champion in the first edition of the tournament! @talhaali71@yahoo.com lolz true... don't forget Shoib Malik's form after his grand PSL. These approaching tournaments are going to be tough for our cricket team i am afraid. T20 is built around scoring big runs and unfortunately our power hitters are out matched by their competition. This league, has taken Pakistan cricket to a pinnacle, it never reached before. It has given a new confidence to Pakistan cricketers, in the ability of their nation to come good for them. And lastly, no longer can Indians throw tantrums, to Pakistan cricketers anymore, like they did in the aftermath of the Mumbai attacks, When a very systematic and vicious ban was imposed on clubs to desist from recruiting Pakistani cricketers. The Indian league surely will be damned for any Pakistani cricketer, who wants to play for his own country, rather than a hostile neighbor! @Weirdity This is the problem with you guys. Just first seasons of PSL got over and you are already beating your chest saying it is better than IPL. Why do you need to compare it to IPL? We don't compare IPL with any other league. Every league is good and important in its own way. Great concept that materialized incredibly well, There should be atleast 5 more teams in the pipeline, eg Gujrat, Hyderabad, faisalabad, abbottabad, and one more team from sindh. The team should be able to sign contracts with an individual for X number of years with whatever financial contract they agree upon. The players should have proper agents who negotiate for them . Every year after the tournament is over each team should be able to name atleast 2 players as franchise players who cant negotiate with any other team but the team should give them a certain bonus based on their performance... The contracted payer can go anywhere as long as they are under the contract however the team can trade them to any other team for money, or another player and or future pics. the players who arent under the contract anymore are free agents and can go back to the old team or sign with any other team... their market value will be determined by their performances, age and potential. proud of Pakistan and PCB!! Credit goes to Mr. Najam Setti. He is really a brilliant and passionate administrator. Pakistan would have been winner if PSL was held in Pakistan rather then Dubai. @Weirdity. What a silly and unnecessary comment. Well done. A normal Pakistan feels good to hear from across the border. @Weirdity oh yeah! just the way Indian Soccer League proved its better than European Premier League!!! Well done sethi sahib. It was a tramendous and great psl. Credit should go to Mr. Najam Sethi for pulling off a successful ‘coup’ (pun intended)! He has done a lot to enhance the image of Pakistan in international stage than any of his compatriots in recent times! Congratulation on successful first version of PSL! I hope next version should be in Pakistan! @Usman - NYC It doesn't matter if neighbors drive the same car or better or worst ... its the car at home that matters and that car is great. Thoroughly enjoyed PSL and looking forward to next years'. Now Pakistani team & national should focus on Asia cup & T20 World cup. If Pakistan squad play with integrity which was shown in PSL. INSHALLAH they can won championships. Pakistan is definitely the Winner. I watched 3 matches in stadium and loved it, whereas I didn’t miss any match on TV. For me all teams are dearer & to choose one out of four is not an option. For those who are comparing IPL BBL, CPL with PSL is futile. Each league has its own audience to cater. As a Pakistani, I don't care who wins or loses in BBL, CPL, BPL or IPL; same goes to Australian, Bangladeshi Indian or West Indies fans; why they should bother about PSL. So therefore chill and enjoy cricket. @Waseem Sarwar , Well said, Waseem...as an Indian i appreciate your frankness just as i am frank enough to tell that Imran Khan and Wasim Akram are one of a kind players of whom the world will never ever see again. They were pure genius and as much they made Pakistan proud they enriched the game itself. From what reports are telling , i learn that PSL has done well in its 1st attempt though it was held in UAE. PSL i feel can be at the most 3rd best behind IPL and BBL competing with Ram Slam of SA, CPL of Windies and English League,. BBL is professionally organised and has seen huge crowds with good coverage and good quality games. If Pakistan can get PSL in Pakistan , it can fight for 2nd place and that is if its organised and marketed professionally and top world players are playing. Hope that can be achieved, all the best! @Weirdity No need to start controversies, just focus on the positives like others including our Indian friends. @talhaali71@yahoo.com : Give it a couple of seasons and players will emerge. We need to add one more team. I hope that we have it next year. I said before the start Of league that all would be revealed after its completion and can say that good job done considering the circumstrances. Best wishes for next year. Psl baby tournament of Pakistan. How could compare with great IPL ?? @Weirdity Dont't show your immaturity by posting these comments regarding IPL. I think We should stop in copying IPL.